Simply put, an aneurysm is an abnormal bulge of a blood vessel. This bulge occurs because of a weakening of the wall of the blood vessel. Over time, the weakened wall of the blood vessel will bulge and grow – this is an Aneurysm. Most all aneurysms will occur in the arteries around the body. A very common location for an aneurysm to form in in the Abdominal Aorta, called an Abdominal Aortic Aneurysm or AAA. Another common artery is in the Thoracic Aorta, called a Thoracic Aortic Aneurysm or TAA. The Aorta is the largest blood vessel in the body. It carries blood directly from the heart and branches come off of it which feed blood to the rest of the body. There are other arteries in the body that can form aneurysms, such as the renal artery (blood flow to the kidney), a cerebral artery (in the brain), and even arteries in the leg, such as the femoral artery or popliteal artery. For the purposes of this section, we will be focusing on Abdominal Aortic aneurysms and Thoracic Aortic Aneurysms. How do you diagnose Abdominal Aortic Aneurysms? For most patients, AAA’s will grow silently in the body. It usually grows very slowly over many years. If AAA’s are large enough, they can be felt on routine physical examination. However, most AAA are found either on routine ultrasound screening, or incidentally by another test such as a Cat Scan or MRI. If an aneurysm is found on routine physical examination, an Ultrasound should be ordered to look at the characteristic of the aneurysm such as size and location. 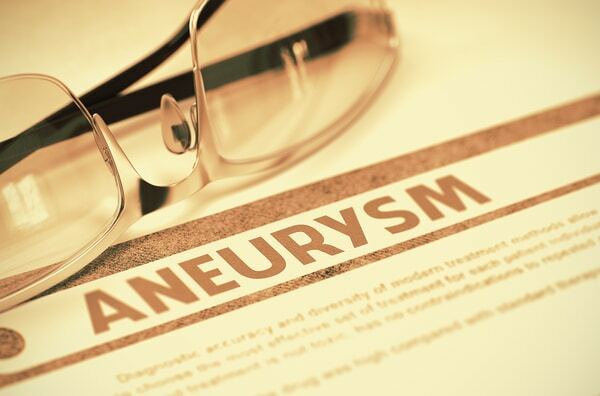 If an aneurysm is large enough, your CVVS Surgeon may decide to order a CT scan to get more information about the characteristics of the aneurysm. Whose at risk for AAA? If a AAA is found, it can usually be monitored by ultrasound once or twice a year along with an office visit with your CVVS vascular specialist. We have our own ultrasound lab in the office and can arrange the ultrasound examination and office visit with your CVVS provider on the same day. If the aneurysm grows to be 5cm in diameter or larger, that’s when it needs to be fixed. The risk is that the aneurysm can rupture and cause massive internal bleeding and possible death. Aneurysms are typically not fixed at smaller then 5cm in size because the risk of rupture is so small that the risk of anesthesia is actually higher than the risk of rupture. However, when the aneurysm reaches 5cm in diameter, that’s when the risk of rupture approaches 10% and it needs to be fixed. Coastal Vein and Vascular Specialists embraces the most advanced and minimally invasive technologies to treat Aortic Aneurysms. With the use of current technologies, 90% of all aneurysms are able to be fixed with a minimally invasive endovascular procedure called an Endovascular Abdominal Aortic Repair, or EVAR. This is where we use small wires and catheters and build an aortic stent graft on the inside of the aneurysm, sealing off the aneurysm so that now all the blood flow goes through the endograft and not the aneurysm. Typically, we don’t even need to make a skin incision – so no stitches are needed! Patients usually spend 1-2 days in the hospital and then are discharged home. Patients can typically return to normal activity in one week. Thoracic Aortic Aneurysms (TAA) can be fixed in a similar manner with an endograft. Sometimes, the more complex anatomical aneurysms need to be fixed with an open operation. Your CVVS Vascular Surgeon can discuss this in greater detail with you.